SMILES: The cruel disease "trigeminal neuralgia" is considered to be amongst the most painful ailments a person can experience. 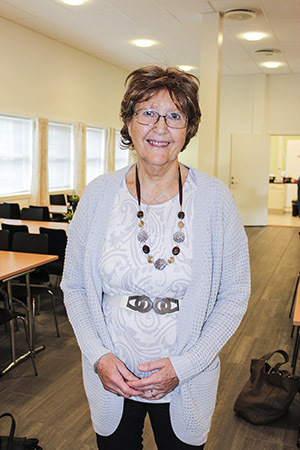 Thorunn Iversen (79) from Brevik lived with the ailment for nearly ten years, but in February this year Jesus put a stop to it all. Throughout several years Thorunn Iversen (79) from Brevik was constantly attacked by intense facial pain. It proved to be the cruel disease "trigeminal neuralgia" which is considered to be amongst the most painful existing diseases. After Svein-Magne prayed for her in February, she has not been affected by the disease. The attacks came very irregularly and were of varying intensity. I never knew when they came. I was always numb from the cheek and up to the temples. 1t was a piercing pain like a "stab", and it was terrible, says Thorunn Iversen from Brevik in Porsgrunn municipality in the county of Telemark. She says that she for closer to ten years had lived with the mysterious pain before becaming aware of what it really was, the disease "trigeminal neuralgia". It is a disease that affects 4-5 of 100,000 people. It is not so well known amongst people, but doctors believe it is one of the most painful diseases one can get. Many have to live with the disease without getting help. Some would rather die than live with the disease. The trigeminal nerve is also the fifth cranial nerve and all people have this nerve on the right and left side of the cheek. It has to do the sensory part of the face When the nerve for different reasons becomes irritated, it can cause severe pain to the face. The pain is often experienced as an electric shock that comes in waves lasting from a few seconds to several minutes. -The duration of the attacks were often 15 minutes, but sometimes longer. The number varied, but they could come several times a month. It was additionally bad if I was out in public. I particularly remember two instances when I was attending Christian meetings. I managed to force myself to sit through the meetings, but I was close to going home. Afterwards my husband had to help me to the front to receive intercession. The pain disappeared, but after some time I was unfortunately hit by another attack. In recent years Thorunn Iversen has experienced numerous healings after the intercession of Svein-Magne Pedersen. Several times she has been healed and told of how God has intervened. -I have experienced many powerful miracles, including healing of fibromyalgia and a 50 year old neck injury. In 1965 I also injured the pelvis and the back was so bad that I could not even participate in the confirmation of my son. After many years of pain, I was free of the pain after intercession by Pedersen, she says. Iversen was also rid of cataracts and could therefore cancel a scheduled operation. The blood pressure was also normalized, clogged veins in the neck were cleared, and panic attacks disappeared. There was no lack in faith for healing, but Thorunn had never mentioned the facial ailment to Pedersen, since they came so irregulary, and she did not know what caused the ailment. On Saturday, February 21 this year Thorunn was hit by horrific pain. Never before had she felt such pain. -I lay in bed screaming with pain, and did not know what to do with myself. It was probably quite a sight. Here was a woman almost 80 years screaming and crying. My husband, Arild, was in despair, but decided to call Svein-Magne Pedersen. Her husband put the phone up to Thorunns ear. She lay in bed and cried and did not grasp much of the prayer. Pedersen was prompted to say that in 15 minutes the pain would subside. -It was absolutely incredible, but this actually happened. We checked the time, and after 15 minutes the pain was gone. Since then I have not had this pain. Never has that length of time passed between two seizures. I am very happy with everything that has happened with me. This gives me great faith, not to mention gratitude to God. It is important never to give up, but trust that God will intervene, says Thorunn.